Returns on home improvement projects vary. In its annual Cost vs. Value Report, Remodeling magazine notes the projects that yield the best returns on investment in a given year. But a host of factors, including the type of market (buyers’ or sellers’) and the region where the home is being sold, ultimately combine to determine if homeowners’ investments in home improvement projects will provide the returns they were hoping for. Though there’s no way of guaranteeing a home improvement project will yield a great return, real estate professionals often cite improving curb appeal as an excellent way to attract prospective buyers and potentially get the asking price or more when selling the home. Improving curb appeal makes even more sense in today’s real estate market, when many people do their own searching via real estate websites such as Trulia or Zillow. When using such sites, buyers will likely be less inclined to click on a listing if exterior photos of the property are not eye-catching. Various projects, including tending to lawns and gardens, can improve curb appeal. An added benefit to focusing on landscaping to improve curb appeal is it promotes spending time outdoors in spring and summer. In addition, many lawn- and garden-related home improvement projects need not require professional expertise. 1. Maintain a lush green lawn. Lawns that fall into disrepair may not give buyers a correct impression about how homeowners maintained their homes. 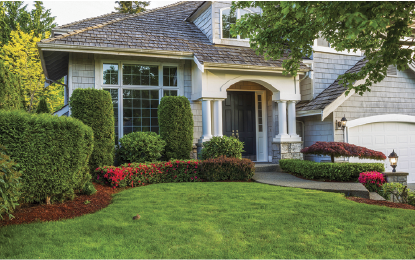 Lawns with multiple dead spots and grass that appears more brown than green may lead many buyers to assume that the home’s interior was equally ill-cared for. Maintaining lush green lawns is not as difficult as it may seem. Applying fertilizer and aerating at the appropriate times of year (this varies by region) can promote strong roots and healthy soil, making it easier for grass to survive harsh conditions like drought. When watering in summer, do so in early morning or evening so as little water is lost to evaporation as possible. Even well-maintained lawns can fall victims to brown spots. According to the lawn care professionals at TruGreen, lawns in regions with hot temperatures and high humidity can be infected with brown patch, a common lawn disease that is caused by fungus, which can produce circular areas of brown, dead grass surrounded by narrow, dark rings. Penn State’s College of Agricultural Sciences notes that removing dew that collects on grass leaves each morning, which can be accomplished by mowing or dragging a water hose across affected areas, can be an effective way to reduce brown patch. Homeowners without much lawn care experience can consult professional landscapers to address the issue. But those looking to sell their properties should note that buyers often walk the grounds of homes they are considering buying. So addressing any issues on the lawn should be a priority for sellers. 3. Confine dogs to certain areas. Dog owners may want to let their pets roam free in their yards. But homeowners about to put their properties up for sale may want to confine their four-legged friends to certain areas. That’s because dog urine can be high in nitrogen. Nitrogen itself is not harmful to lawns, but in high concentrations it can contribute to yellow or brown spots. Also, highly acidic dog urine may even adversely affect pH levels in the soil. Curb appeal can go a long way toward helping homeowners sell their homes, and a lush lawn can be used to catch the eye of prospective buyers.